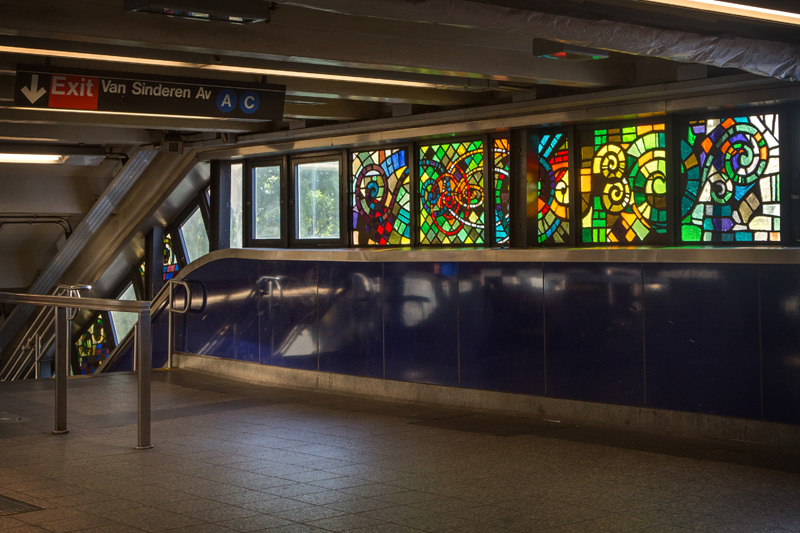 Continuing my exploration in search of attractive glasswork on the New York City subway leads me to Brooklyn and the J Line. 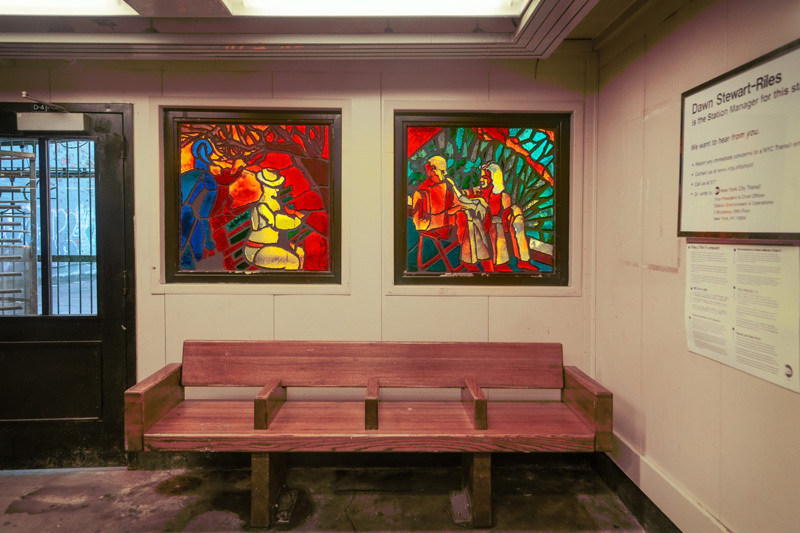 Though a few of the works installed on the line are currently undergoing conservation, there are plenty of stations still worth visiting with attractive art. 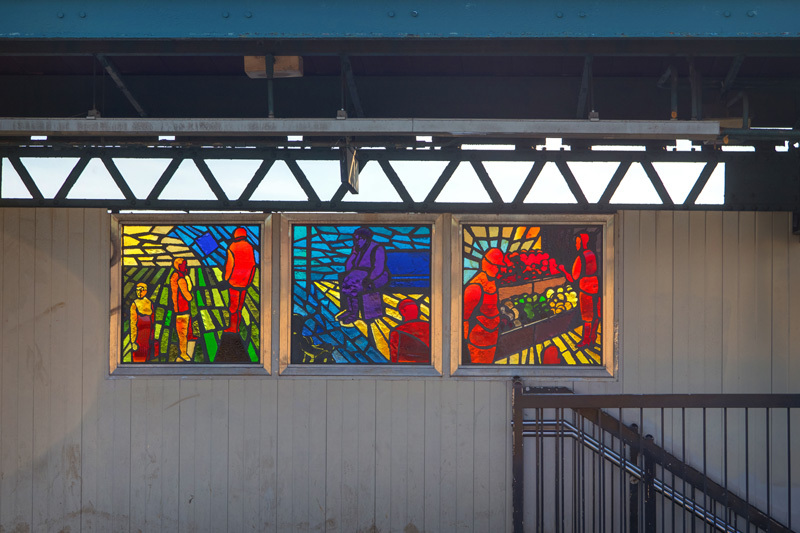 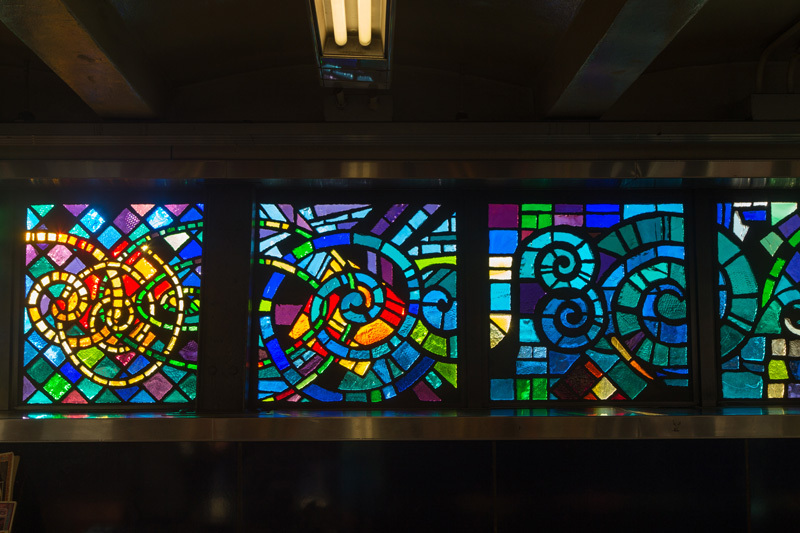 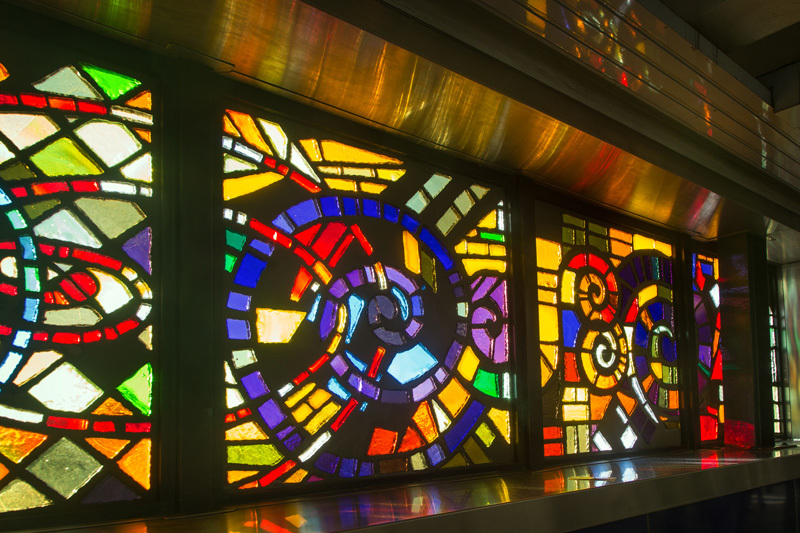 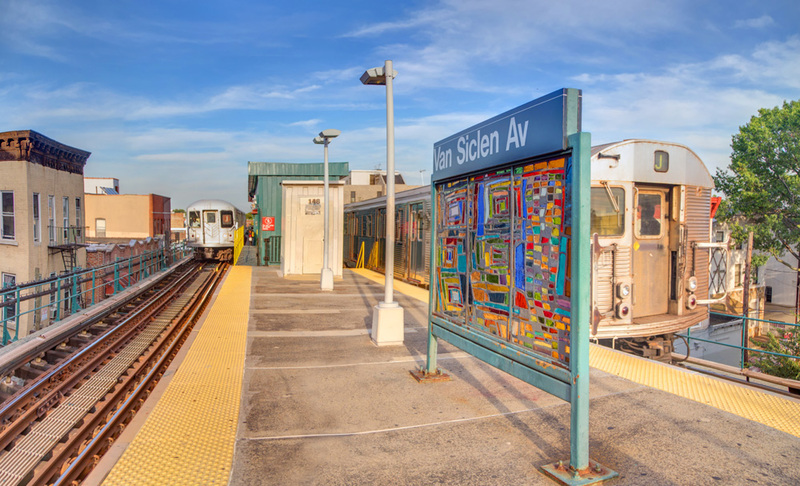 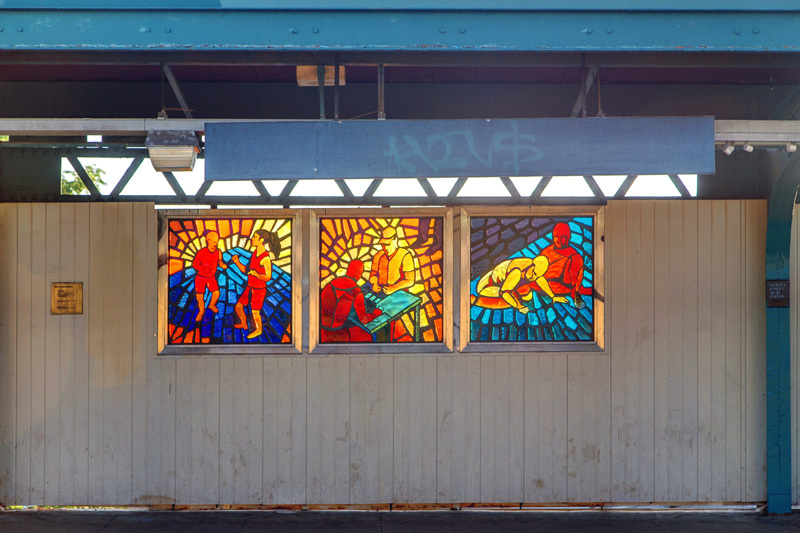 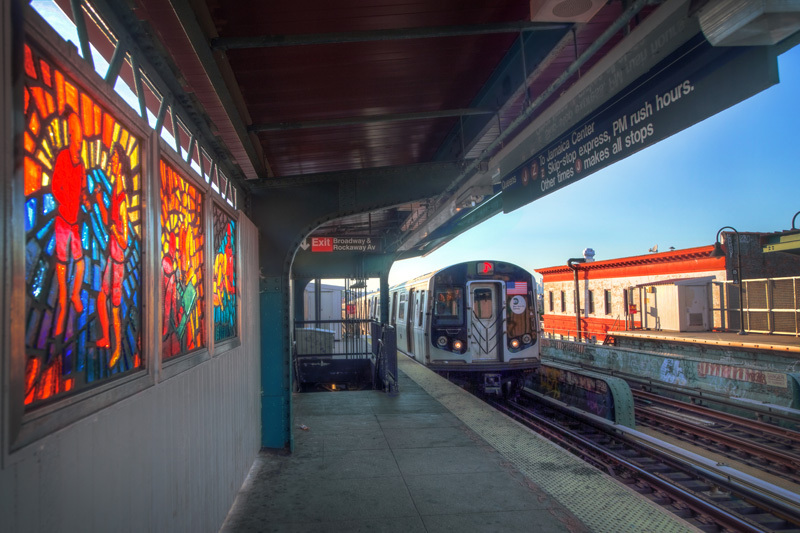 While some of the stations we visited in the Bronx had only a few panels of art, several of the J line stations have art on a significant scale – Broadway Junction, for example, has a total of 75 faceted glass panels. 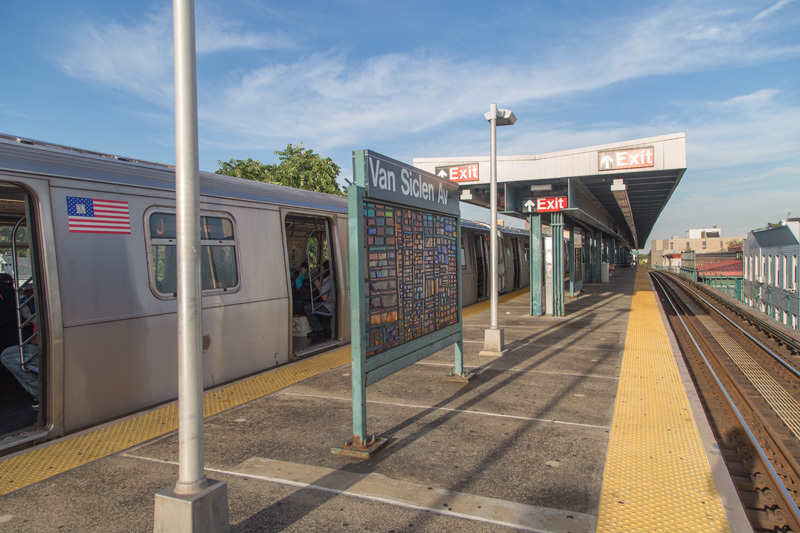 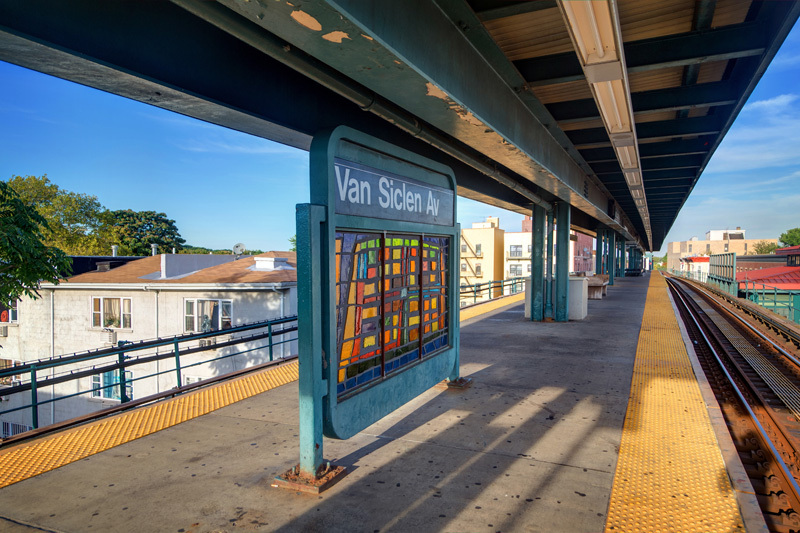 Bold, bright colors await you on the platform of Van Siclen Avenue. 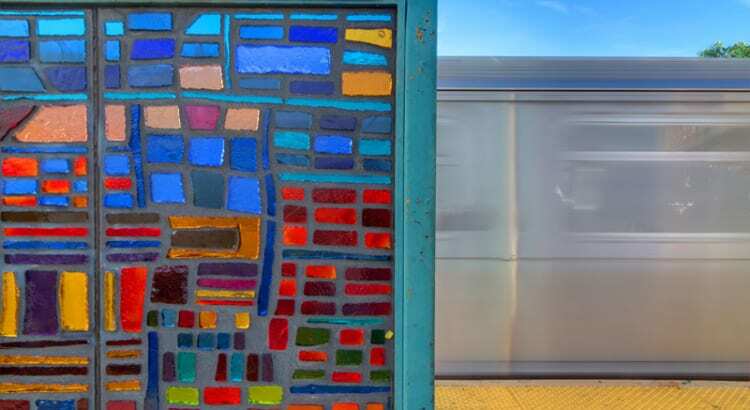 Influenced by the geometric shapes visible from the platform – buildings, windows, doors, brickwork – the landscape has been rendered into an abstract geometric view that splashes the concrete of the platform with color. 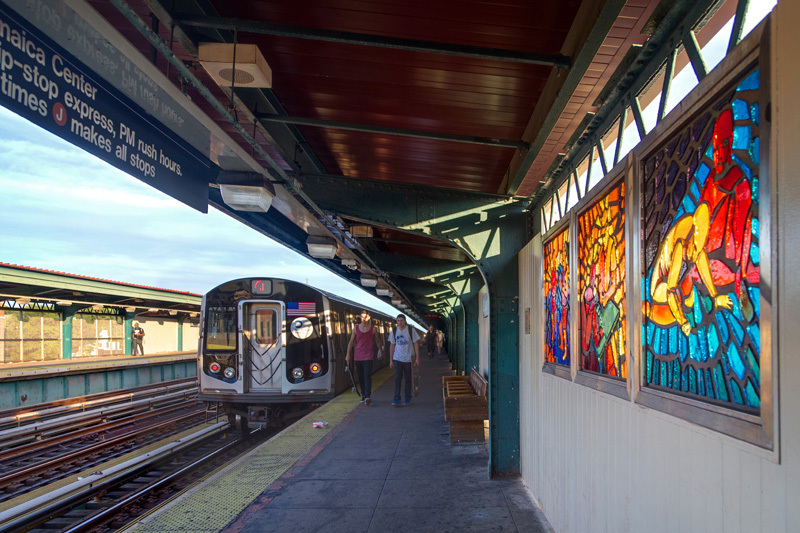 Twenty-one faceted glass panels serve as windscreens spread along the station’s entire elevated platform. 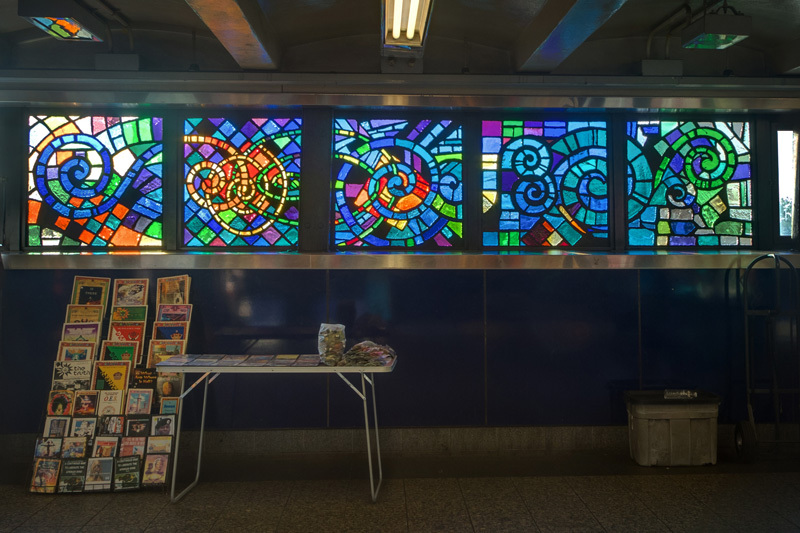 Situated at the crossroads of several subway lines, the art at Broadway Junction appears in various locations throughout the complex. 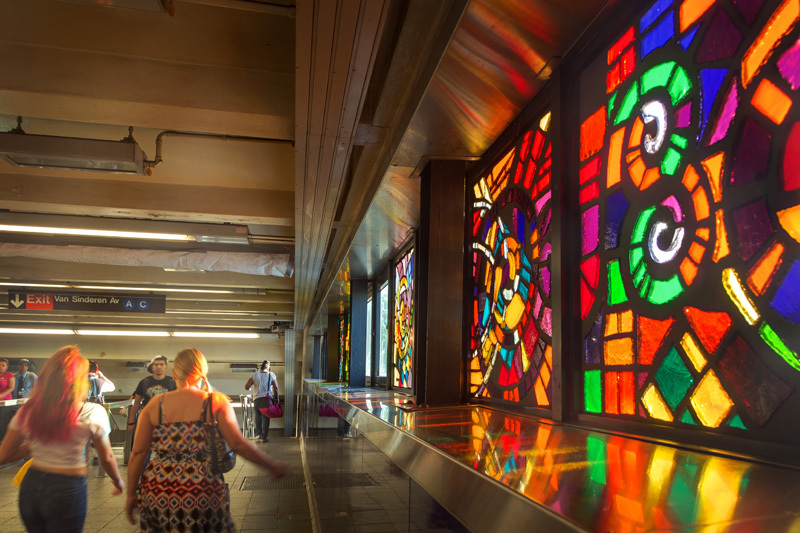 Perhaps the most attractive part is the long pedestrian walkway above, which has long strings of colored glass on either side. 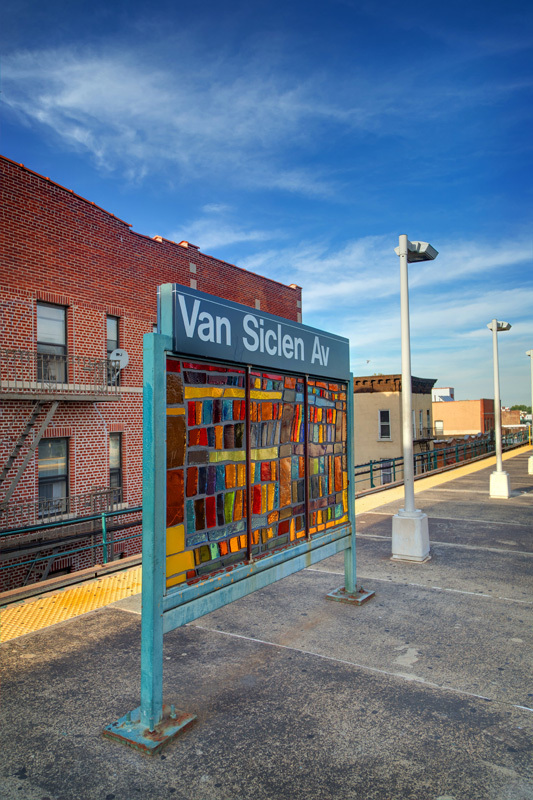 Its complexity is nothing to sneeze at – a total of 75 panels were installed at the station… ensuring that no matter which way the sun is facing, at least somewhere there will be colored light shining through. 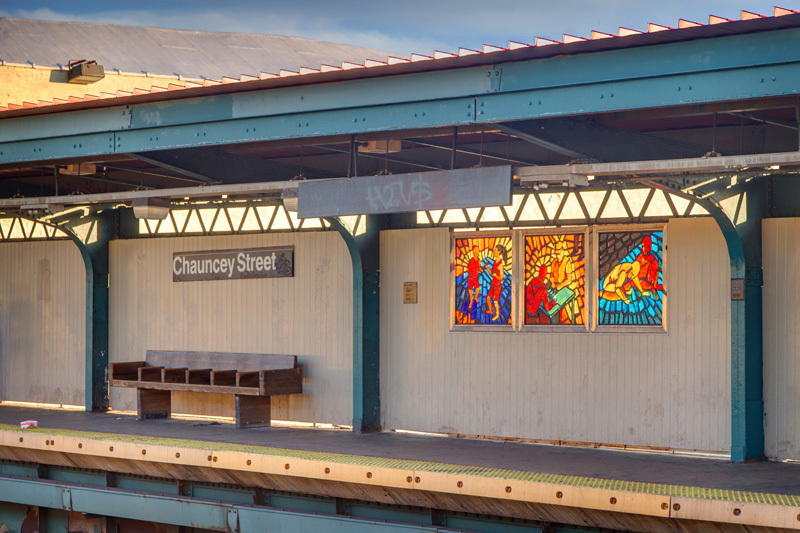 Our last stop for the day is Chauncey Street, where artist Maria Dominguez created sixteen 13″ x 13″ paintings, which have been translated into faceted glass. 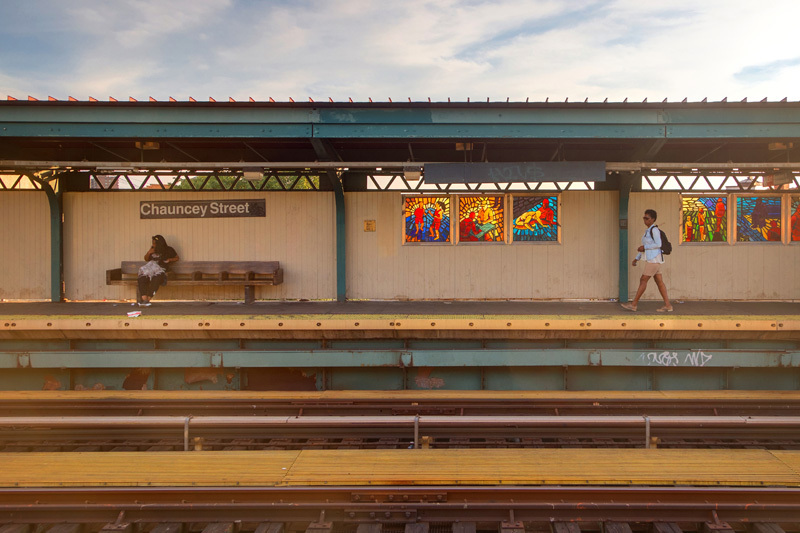 The paintings themselves were inspired by photographs the artist took of the neighborhood surrounding the station, and the people that call that area home. 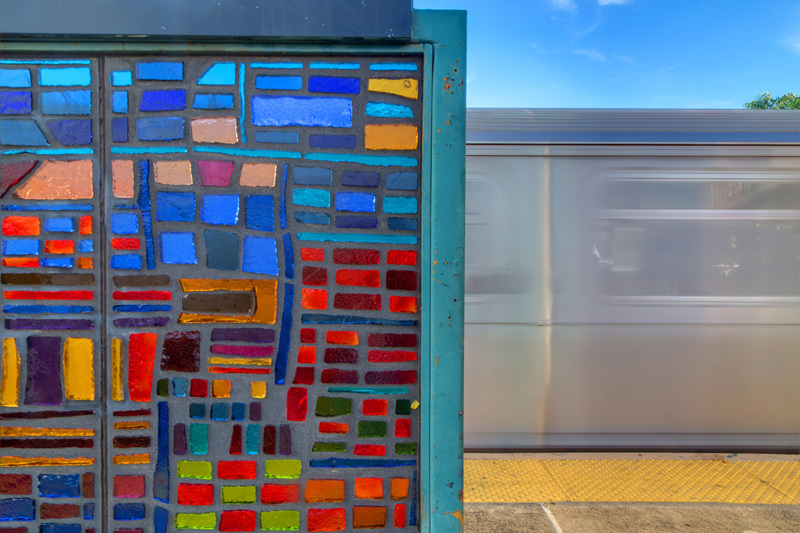 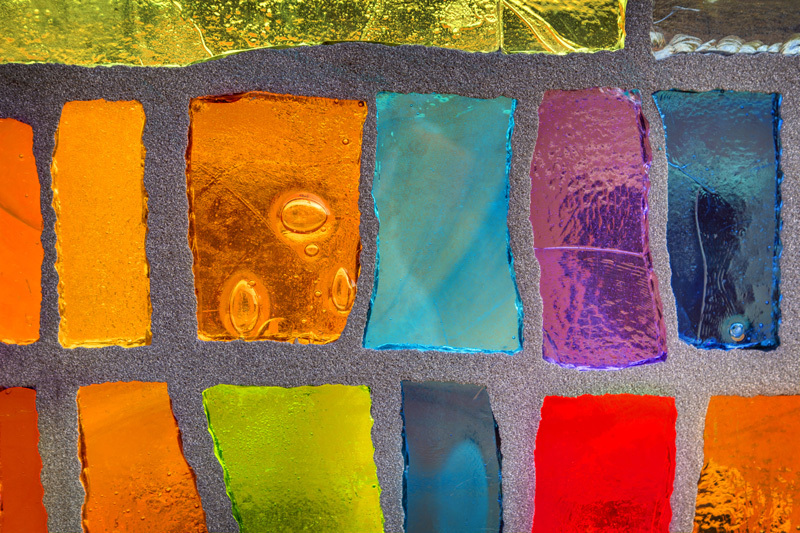 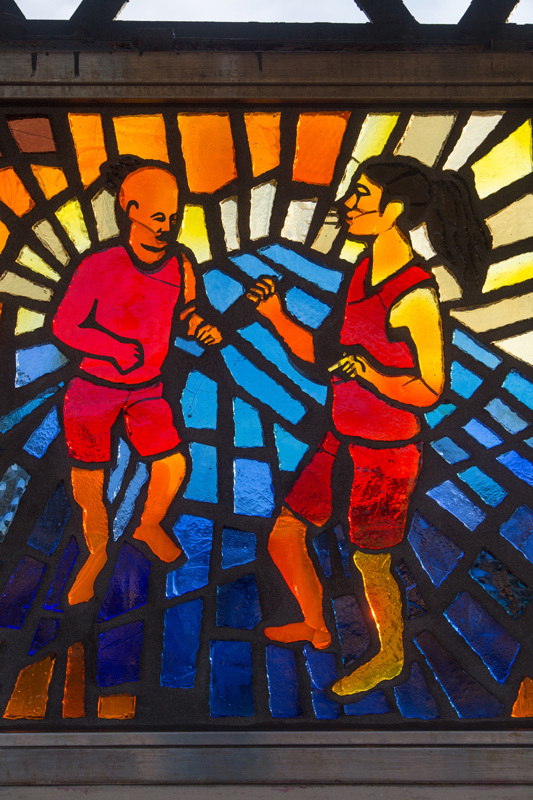 Depicted in the colorful panels of glass are heading to work and school, shopping, or just relaxing and passing the time. 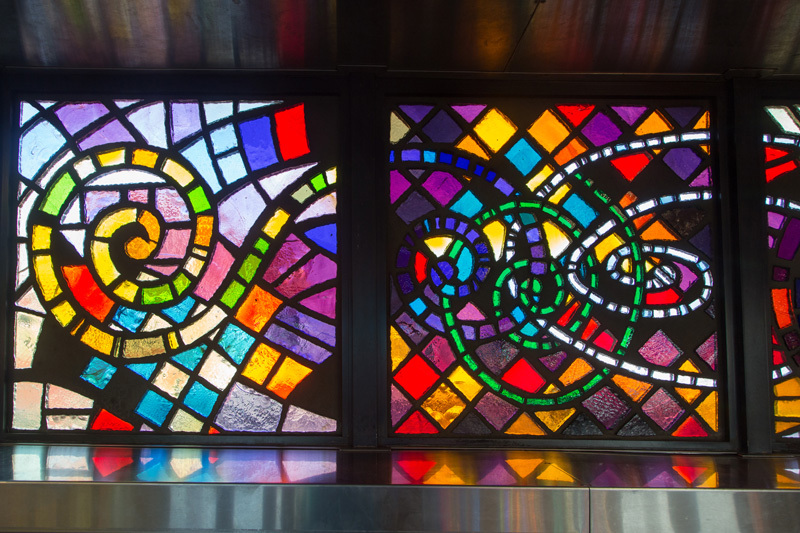 Some of the artist’s original paintings, and their translations in faceted glass. 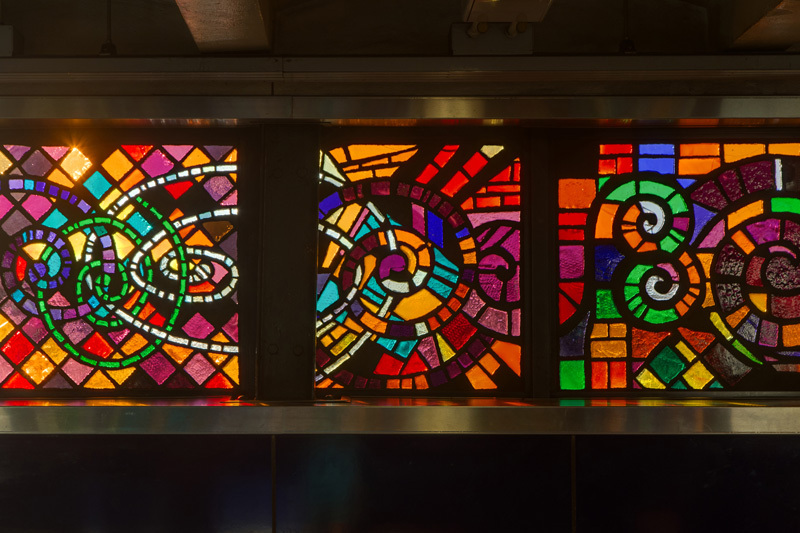 Photos from the artist’s website. 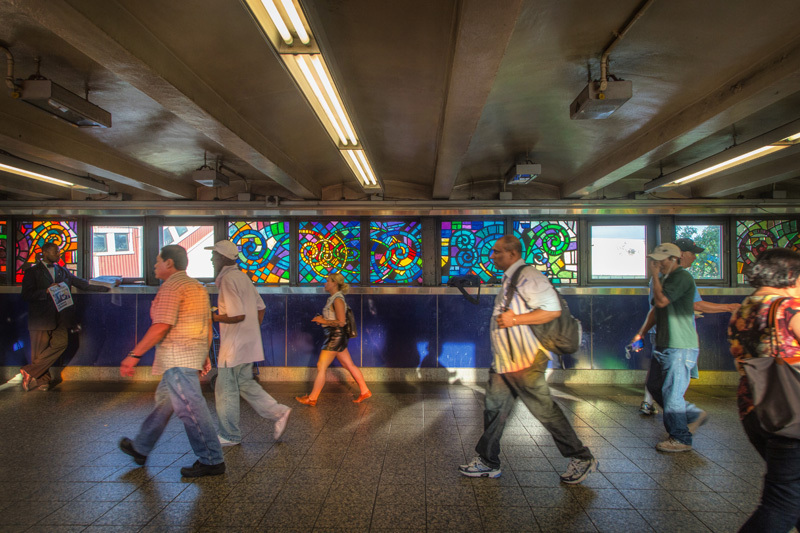 That wraps up today’s quick visit out to see some of Arts For Transit’s varied offerings. 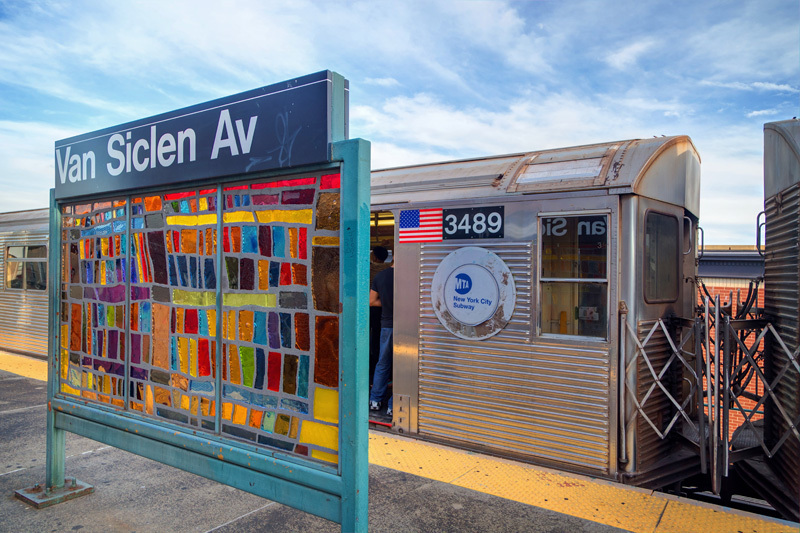 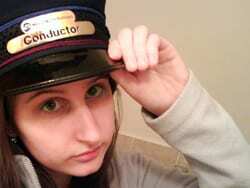 Next week we’ll be back to visit some more stations on the J Line.